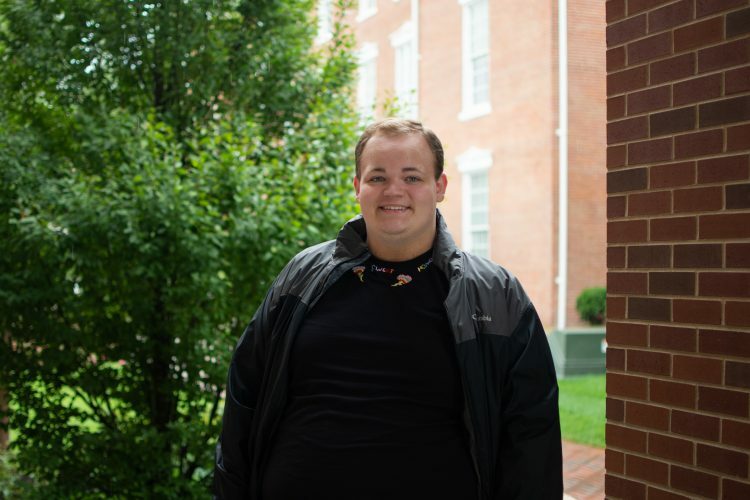 If you visit the second floor of Mathes Hall, you might be lucky enough to see Spencer Ruwe, a junior vocal performance and musical theater major, resident assistant (RA), ardent singer and owner of a grand 76-record vinyl collection. The Hilltop Monitor was able to speak to Ruwe about his love of music, being an RA and his love of the Jewell community. “I was always the kid growing up that was into music. I always took it really seriously and turned out to be pretty good at it. I did well in high school so when I came to Jewell I thought I’d give it a try,” Ruwe said, describing why he took such a liking to music. Ruwe is very involved with the music community, working as an actor and musician. “I have a church job at Village Presbyterian, one of the largest Presbyterian churches in the Midwest. I do all other kinds of gigs. I just got cast in a professional musical, Songs for a New World, with KC VITAs [a professional ensemble of singers based in the Kansas City Area],” Ruwe said. Though Ruwe loves performing, he is also passionate about listening to music. His impressive vinyl collection did not happen overnight. “I started out in high school with a really cheap record player by Crosley. I was buying more vinyl and doing more research and found that I had a terrible record player. Now I have an Audio-Technica. I’ve just been thrift shopping and buying new vinyl now for a couple years now, and I have a small collection; it’s cute,” said Ruwe. One of Ruwe’s favorite artists is Kesha, whom he could talk about with ease. “I really like Kesha’s new stuff. Her new music has a lot of nuance in it, and I appreciate that. You have to know what you’re listening to to get it. It’s beautiful,” Ruwe said after a moment’s reflection. Spencer is enthusiastic about being an RA. He recalls exactly when he knew he wanted to be an RA. “I always wanted to do it because my dad was an RA in college. I visited his old school and he told me about when he was an RA and I was like ‘that sounds like the best job, I want to do it.’ So I just went for it,” Ruwe said. Being an RA comes with significant responsibility that might be overwhelming to some. Spencer, on the other hand, loves his role in the community. “I really enjoy programming events, getting to know residents and helping people out when they need it. Really just establishing a relationship with first-years. I know when I came in, the RAs were really influential in making me feel comfortable being at Jewell. That’s what I want to do for first-years as well, ease them into being independent and being in college. It can be scary,” Ruwe said. Furthermore, Ruwe really appreciates William Jewell College’s sense of community. “I’ve lived in the dorms for three years now so I kinda get the feel. I can always walk down the hall and see someone I know. The [Pryor Learning Commons] is great because it’s always crawling with people. Just the fact that everywhere you go you know someone. That’s real nice,” said Ruwe.